Ready to get started on AHIP? The attached sheet outlines instructions and discounts available through each carrier. Plan ahead. Be sure to have all your passwords organized and easily accessible before you begin. Certification is complicated. To make things easier, we've created an easy all-in-one checklist. 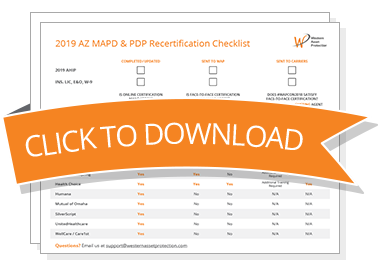 The checklist tells you which carriers require face-to-face meetings, whether WAPCon fulfills that requirement and other important information. There are two versions of the checklist - one for new agents and one for existing agents. Be sure to download the appropriate checklist for you! We are updating 2019 information as it becomes available. The carriers listed in orange below have been updated for 2019. Check back frequently as we will be adding more carrier updates every week. As always, we're here to make things easier for you. If you have any questions, contact us.